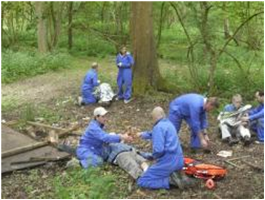 This course is suitable for those that have previously undertaken hostile environment training or those who have worked in hostile environments before, our 3 day OSSFAT course goes someway to address organisation's responsibilities/duty of care towards their employees. Those who operate in hostile environments, post conflict zones, areas of civil unrest, regions that have suffered natural disasters or experience extremes of climate and if you are vulnerable to robbery, assault or kidnap. On completion of the course instructors will be given an aid memoir for post course reference. All delegates will also receive an Emergency First Aid at Work certificate and booklet. All delegates should satisfy themselves that this 3 day course will adequately cover the needs of their pre deployment risk assessment. £3,000.00 + vat when run at your venue for up to 10 delegates. Need to book an OSSFAT course? Why not call us on 01985 843100 for a chat. Alternatively, drop us an email info@aid-training.co.uk and we will get in touch.